Combine carrots and beets in large bowl. Whisk dressing, orange zest, juice and mustard until blended. Add to carrot mixture; toss to coat. Refrigerate 1 hour or until chilled. Add onions and nuts just before serving; mix lightly. For a change of pace, substitute pistachios for the toasted walnuts. Prepare using bagged cut-up carrots purchased in the produce section of your supermarket. Or, substitute 3-1/2 cups broccoli slaw for the carrots. 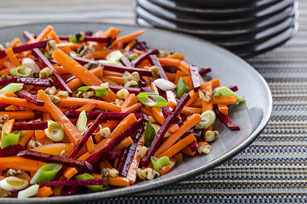 The carrots in this colourful salad provide an excellent source of vitamin A.